In keeping up with my extracurricular doc-building activities, I am happy to release the latest iteration of my vCAC implementation guide for the deployment and configuration of vCAC 6.0. This unofficial Proof of Concept and Detailed Implementation guide is provided, with no guarantees (or support), to assist with the end-to-end implementation of vCloud Automation Center 6.0 in a pre-configured vSphere 5.x environment. To continue the momentum, now we dive into installing the IaaS components of vCAC. Part 4 of this series walks you through the vCAC IaaS Installation Wizard, which is a significant improvement from previous versions. A few configuration details and GO! Infrastructure as a Service (IaaS) enables the rapid modeling and provisioning of servers and desktops across virtual and physical, private and public, or hybrid cloud infrastructure. Modeling is accomplished by creating a machine blueprint, which is a complete specification for a virtual, cloud, or physical machine. Blueprints are published as catalog items in the common service catalog. When a user requests a machine based on one of these blueprints, IaaS handles the provisioning of the machine. IaaS also allows you to comprehensively manage the machine life cycle from a user request and administrative approval through decommissioning and resource reclamation. Built-in configuration and extensibility features also make IaaS a highly flexible means of customizing machine configurations and integrating machine provisioning and management with other enterprise-critical systems such as load balancers, configuration management databases (CMDBs), ticketing systems, IP Address management systems, or Domain Name System (DNS) servers. Moving right along (and behind schedule), Part 3 of this series will walk through the configuration of all the prerequisite requirements for the Windows-based IaaS component. The IaaS engine is a .NET-based component that resembles (an uncanny resemblance) previous versions of vCAC 5.x. For vCAC 6.0, IaaS is consumed through vCAC’s primary framework (deployed via the vCAC Virtual Appliance) once it is installed and registered. The prerequisites for IaaS are identical to previous vCAC versions, which I’ve covered in detail in the vCAC 5.2 Detailed Installation Guide. 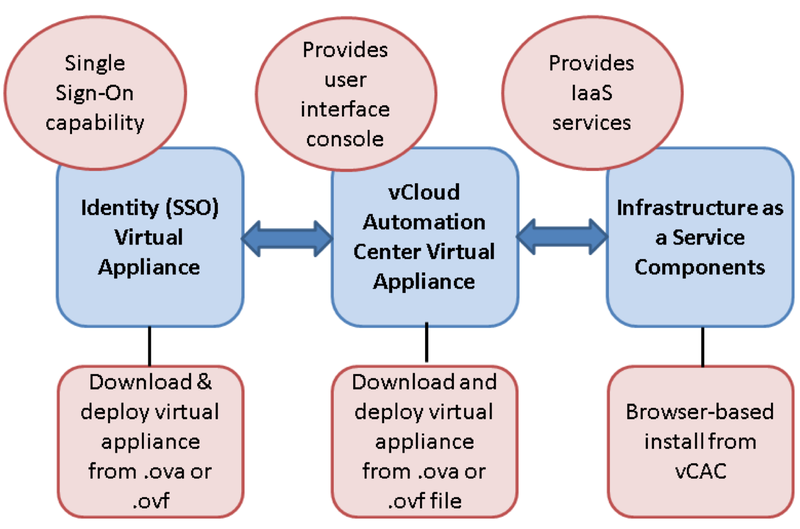 vCAC VA – Delivered as a Virtual Appliance (.OVA), vCAC’s primary interface for administration and user self-service. Also includes an imbedded vCO server. vCAC ID – Delivered as a Virtual Appliance (.OVA), vCAC’s stand-alone Single Sign-On engine, which provides multi-tenant LDAP and Active Directory authentication services for vCAC tenants. vCAC IaaS – Windows Installable (.exe), vCAC’s IaaS engine for heterogeneous infrastructure as a service (covered in detail in Parts 3 & 4). Additional components to the solution (based on licensing) include the vCAC Financial Management engine (delivered as an .OVA), and the Appication Provisioning engine (also an .OVA). Both are covered much later. Part 2 of this series will dive into the the configuration/integration of the vCAC VA and ID/SSO VA components. NOTE: this video guide was created using vCAC BETA builds and some of the steps will differ from the generally-available builds. I will try to update all the videos pre-GA.
VMware’s vCloud Automation Center (vCAC) 6.0 release is just around the corner and the anticipation for what’s next is tremendous. vCAC 6.0 introduces a brand-new interface, new concepts, new echosystem integrations, and the quickest path to realizing the benefits of the Software-Defined Datacenter. And then there’s XaaS — the killer technology that will allow cloud shops to deliver their entire datacenter operation as a governed, entitled, life-cycled service. To learn more about vCAC 6.0, visit VMware’s cloud management blog. I will be rolling out these videos as they get through editing…aiming for 1/week. Deeper integrations with vCloud Director – vCAC 5.1 added basic support for consuming vCD as an Endpoint to enable vApp deployments into VDC’s. Although functional, the options were limited, especially with “day 2” management of vApps. vCAC 5.2 adds greater functionality, deployment options, support for all three VDC allocation models (PAYG, Allocation Pool, Reservation Pool), and the ability to manage individual machine within the vApp independently…a much needed addition. Added support for vCloud Networking & Security (vCNS) use cases – vCNS integration brings with it the ability to discover vCNS network entities, such as VXLAN and security groups. This enables the consumption of these networks as part of an application deployment model for greater control and security. Support for KVM (RHEV) Hypervisor – Adding native support for KVM as a platform continues vCAC’s trend towards the “manage all infrastructures” model and adds to vCAC’s already extensive native (“out of the box”) support for heterogeneous infrastructure…with much more to come. VMware’s cloud strategy and vision of delivering an technology and business agility through IT transformation took a significant leap forward with the acquisition of DynamicOps in mid-2012. The following several months were crunch-time for R&D as DynamicOps Automation Center evolved into vCloud Automation Center (vCAC) 5.1. Available as an a la carte product or as part of the vCloud Suite (Enterprise), vCAC 5.1 completes a comprehensive cloud solution that delivers Infrastructure as a Service (IaaS) and VMware’s vision of a Software-Defined Datacenter (SDDC). For those organizations on the journey of transforming their datacenters to meet the demand of a modern IT consumption model, it’s easy to envision what cloud euphoria could/should look like. That’s mostly because vision is quite cheap – all it takes is a little imagination (maybe), a few Google queries, several visits by your favorite vendor(s), and perhaps a top-down mandate or two. The problem is execution can break the bank if the vision is not in line with the organization’s core objectives. It’s easy to get carried away in the planning stages with all the options, gizmos and cloudy widgets out there – often delaying the project and creating budget shortfalls. Cloud:Fail. But this journey doesn’t have to be difficult (or horrendously expensive). Finding the right solution is half the battle…just don’t go gluing several disparate products together that were never intended to comingle and burn time and money trying to integrate them. Sure you might eventually achieve something that resembles a cloud, but you’re guaranteed to hit several unnecessary pain points on the way.